What are the advantages of a reverse knife grip? – Conflict Research Group, Intl. What are the advantages of a reverse knife grip? In this article, I will be discussing the use of the knife in Pikal or reverse grip, primarily with the edge facing in, as opposed to facing out. Before discussing the actual usage, methodology, and reasons, a little background information, and history of this method may be in order. The first widely examined use of the knife with edge in was done by Master at Arms James Keating ( www.jamesakeating.com ) on his 3 volume Drawpoint series of instructional videos. In Drawpoint Vol. 1, he teaches the thrust from a forward of the hip waist carry, with the edge facing inward. He then flows into rotary picking, and in subsequent volumes, expands it into Slash & Thrust and Palasut drills, taken from Filipino Martial Arts. After this, the internet forums really started becoming popular, and forums for specific activities started popping up. On the knife related forums, a gentleman by the name of Don Rearic started talking about using the knife in this manner, which I will refer to as RGEI (reverse grip edge in) for ease of use. Don ( www.donrearic.com ) was telling people how to use the knife RGEI, and it’s benefits in CQC, or Close Quarters range encounters. The miracle of the internet has been the way that it attracts like minds, and soon, another member of the forum, who preached the same message, was promoting RGEI as well. This gentleman was SouthNarc ( www.shivworks.com & www.totalprotectioninteractive.com ) . SouthNarc produced a DVD on the subject entitled Reverse Edge Methods, and the methodology has been catching due to the work these pioneers did. Other proponents that deserve mention are Ray Floro of Australia ( www.florofighting.com ), who teaches his take on this method, and, I believe, coined the term “backwards knifer”, and Nigel February and Lloyd Dejong of the Piper system in South Africa ( www.pipersystem.com ) which is a modern African system of combat. So, now that we have the background, the why’s need to be answered. 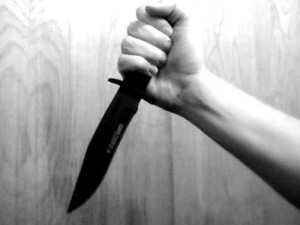 The first question always asked is why do you hold the knife with the edge toward you, and not the enemy? The answer is both simple, and deep. The way our bodies work, we are stronger pulling then we are pushing, which means our rips and cuts will be stronger. Another reason is it allows for a ripping out and cut after the thrust. RGEI is primarily a thrusting method, the shearing cuts and rips are used to clear obstructions, such as arms, out of the way to continue thrusting. RGEI works as a reactive application of force, and it is uniquely applicable to self defense due to the use of gross body mechanics, in every facet, from the draw, to the sewing machine like thrusting. All these actions rely on gross body movement, which due to adrenaline and stress are the easiest, and most likely to succeed in a combative self defense situation. We draw the knife in a convulsive, full grip manner when using a fixed blade. The wrist is locked, and the knife moves immediately from draw to thrust without any chambering or preparatory movements. Simultaneous with drawing the knife while responding to an attack, we use our off, or live hand, as our defense, warding and clearing to make room for the knife to do its job. If the attacker we are defending against happens to block our counter attack, we hook and shear his arm out of the way. By having the edge of the knife in, towards us, this creates a situation where we have de-fanged the snake, and also made a new opening to launch our next series of thrusts, if required. A very important thing to remember, is that none of this occurs in a vacuum, we never forget to fully integrate our other weapons available, such as using our live hand to punch and create openings and distractions for the thrusts and shears to be effective. Another reason this method is effective is the possibility of using the knife as a trapping method. By the edge biting into the arm, it is effectively neutralized, and easier to manipulate, if the opportunity arises. Finally, one of the best reasons for studying RGEI is the transferability of the skills to non-edged tools. Using this methodology, since it relies on the point of the weapon, not the edge, you have a “software” downloaded in your brain that will operate with any hand held blunt weapon, such as a closed folding knife, pocket stick, pen or marker, cell phone, eyeglass case, the list is endless. The only difference would be the kind of damage done. With the knife, you will create thrusting wounds, with a blunt object, you will be making blunt force trauma on the attacker. This is not a passive, stand back and react method, it requires rapid and overwhelming aggressiveness to overcome an attacker who has initiated a criminal assault, has the advantage of surprise, and presents a big enough threat to merit potentially lethal force. The aggressiveness of this method is obvious from the default defensive posture, which is forward facing, and the forward drive instilled through the thrusting action. I would recommend any one interested in a easy to learn, quick to apply, easy to retain, and highly effective method of self protection to pursue this path, you won’t be disappointed.